Love them or hate them, those plaster sculptures dotted around Valletta cost taxpayers €68,500. The cost of the public art installation of 13 statues – part of the Valletta 2018 project Kif Jgħid il-Malti – was revealed by Culture Minister Owen Bonnici in his reply to a parliamentary question posed by Nationalist MP Therese Comodini Cachia. Dr Bonnici said the works had been welcomed by the public – though when they first put up, they were greeted by reactions ranging from puzzlement to sniggers. Just two days, after they were unveiled, a number of them were vandalised. 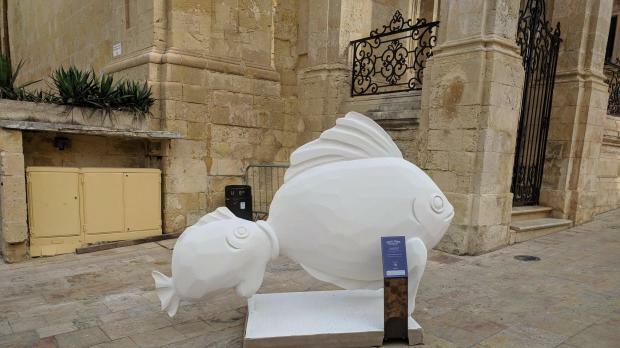 The sculptures, designed by Joel Saliba, visually depict Maltese proverbs and were meant to encourage people to reflect on Malta's national language. The project was chosen on its “artistic merit”, Dr Bonnici said. Margaret Pace and Ikona Artworks Ltd helped Mr Saliba, while Sarah-Lee Zammit helped with research, with Chris Galea providing logistic support and Perry Scenic Ltd manufacturing the designs. The temporary installations vary from one of a prickly pear-headed figure looking at their watch ('Iż-żmien isajru l-bajtar') - to one of a minnow trying to swallow a far bigger fish ('Il-ħuta ż-żgħira qatt ma kielet lill-kbira') and another of an eyeball resting in a spoon ('L-ewwel ma tiekol l-għajn').